Samsung Electronics has cut its revenue and profit forecasts for the third quarter, after the disastrous launch of its flagship Galaxy Note7, which eventually led to the company recalling the smartphones and stopping their production in the wake of reports of overheating batteries. The South Korean company said Wednesday that revenue for the quarter was likely to be about 47 trillion won (US$4.2 billion), down from the 49 trillion won that it had expected earlier this month in a preliminary forecast. Operating profit is expected to drop by about 2.6 trillion won to 5.2 trillion won. The company said it was revising its revenue and profit forecast because of the Note7 debacle. Samsung said Tuesday it was discontinuing production of the Note7 smartphone, after fires and even explosions were reported involving replacement units that had been issued after it was found that a battery-cell issue could lead to overheating and even fires in some of the Note7 phones shipped since mid-August. About 1 million Note7 phones were to be replaced by the company under a recall announced by the Consumer Product Safety Commission in the U.S. in mid-September. 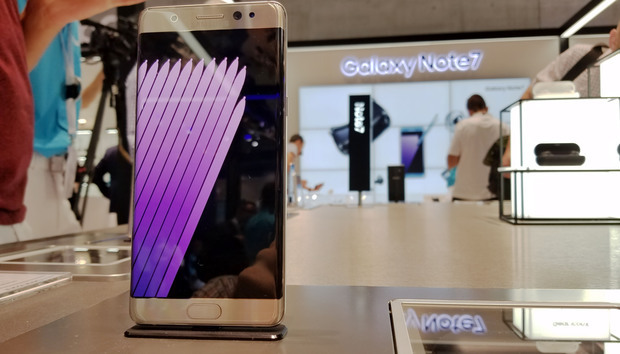 Among the commitments the company gave to customers in the U.S. under the recall program was a promise to replace the smartphones with new Note7s, or refund the cost of the phone, or exchange it with Galaxy S7 and S7 edge smartphones. By Monday, when the company asked carriers and retailers worldwide to stop the exchange of the Note7, only the other options were left to customers. The reduced revenue and profit forecast could reflect the lost business in the third quarter and the costs of the recall.